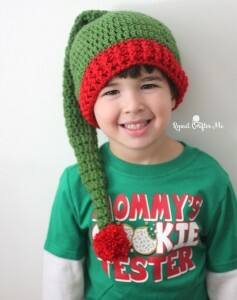 This adorable elf hat pattern is available in all sizes from newborn to adult! Thus, it’s the go-to elf hat pattern for the entire family. It’ll be great in photo shoots with Santa or for your holiday family portraits. You will need a worsted weight yarn in Christmas colors and an H crochet hook.